Mindroutes: GREEN BELTS UNDER THREAT - WHAT TO DO? 'Green belts' seemed to be a good idea, to prevent the inexorable outward sprawl of our cities, particularly the so-called 'ribbon' developments that began in the '30s. In the UK, with our propensity for low-density, low-rise housing, our already very sprawling cities would have been even more flacid. We may have the greenbelt policy to thank that we still have countryside within easy reach of our cities. However the very idea of the greenbelt is not seen as all that expedient any more, since we have a need for many thousands of new homes, according to government figures. Many areas of greenbelt are being designated as essentially 'up for grabs', around London, Nottingham, West Midlands and northern cities. This is not good news. We cherish our green and pleasant land, or what is left of it. General concensus is that vast sprawling suburbs do not make such wonderful places to live anyway. So couldn't our cities absorb the extra housing need and grow 'from within'? Well the government is saying that even if we do use all the 'brownfield' sites in our cities we would still not have enough room for the needed housing. New long distance transport schemes are not going to help the situation either. London's Crossrail, for instance will make Maidenhead and Shenfield relatively more attractive to live in than Wandsworth or Homerton. Ironically outlying suburbs and domitories will have better transport than many parts of inner city London, a stone's throw from the commercial centres, especially south London as we all know. Should our transport policy not be contributing to encouraging the 're-habitation' of our inner cities and discouraging the 'flight to the suburbs' as started in the early decades of the 20th century? 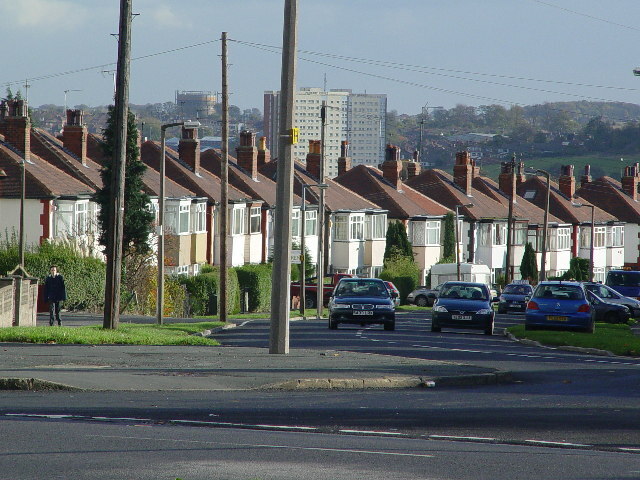 Suburban Leeds: this is what city-living currently means for most English. An unsustainable dream? Schemes such as extending the tube lines south of the river (but not too far out), reopening some of the closed inner city stations, such as have been discussed on other threads (York Road, South Kentish Town among them); or capitalising on some of the existing lines that have low station densities (the JLE for example) could all make the inner city more accessible and attractive to residents. Why live in Camberwell when you can get to work quicker from Maidenhead? Maidenhead is currently experiencing a building boom in anticipation of this. Camberwell, to my knowledge, is not. Something our new subterranean stations need not do is take up surface space. New stations at Shepherd's Bush, Canada Water, Bermondsey and Wood Lane wantonly waste their 'air-rights' on fairly unnecessary station buildings. Land that could be used for residential dwellings. Another aspect of the problem is that England has never had much of a civic culture. I say England, not the UK, because it can be argued that Scotland has. With some exceptions our cities have been founded on rapid industrialisation, with an ungainly mass urbanisation of a predominantly rural people who were fond of their privacy. The English are best at relating to the village, not so much the city. The village is somewhere to live, the city somewhere to work. And our settlements reflect that. Extensive village-like residential suburbs surround compact, self-conscious city centres. We have some truly wonderful villages in England, and some truly appalling cities. The 'we don't do cities' problem is a paradox. The more reluctant we are to engage in the urban, the more unpleasant our cities become, which fuels an exodus, which feeds back to greater neglect. Large villages do not great cities make. If we take the example of Paris, the RER (Crossrail equivalent) was intended precisely to allow Paris to grow. It achieved this, but it never led to a depopulation of Paris, because it's just a nice place to live. Such a scenario in London is harder to imagine. Many recent attempts at urban residential spaces have been ungainly, crippled by the privacy expedient, retiring just before becoming truly part of the urban fabric, behind some 'semi-private space', a hedge, wall, a cul-de-sac or some pastiche pastoral architecture that just doesn't wash, conscious of the unpleasant side of 1960s high-density development and keen to avoid any association. Our suburbs were the attempt to reconstruct the village in the town, and our inner city developments have attempted to reconstruct the suburb in the city centre. Our aristocracy is one of the sectors of our class-ridden (yes, it is) society that is different. Perhaps spoiled by magnificent country retreats, perhaps just wealthy enough to obtain any comfort, their approach to city life is rather different, and some of the more salubrious areas of west London reflect this. Here, London meets Paris, Vienna and St. Petersburg on their own terms. But the elegant Victorian pied-a-terre is the legacy of the bourgeois flanneur, not the mainstay of the proletariat. To the aristocracy, as with most things, the normal rules do not apply. At the other extreme is the low-income council tenant. Shoved onto cheap, avant-garde or just downright experimental estates after slum clearances and nazi bombs, theirs have become amongst the most detested housing schemes in all our history. The two experiences are utterly different, the one too often used to discredit the other. Things have been changing. Richard Rogers coined the term 'densification' way back, as the new expedient for urban planning. New schemes tend to be more mature, oftentimes contributing contextually to the urban space. 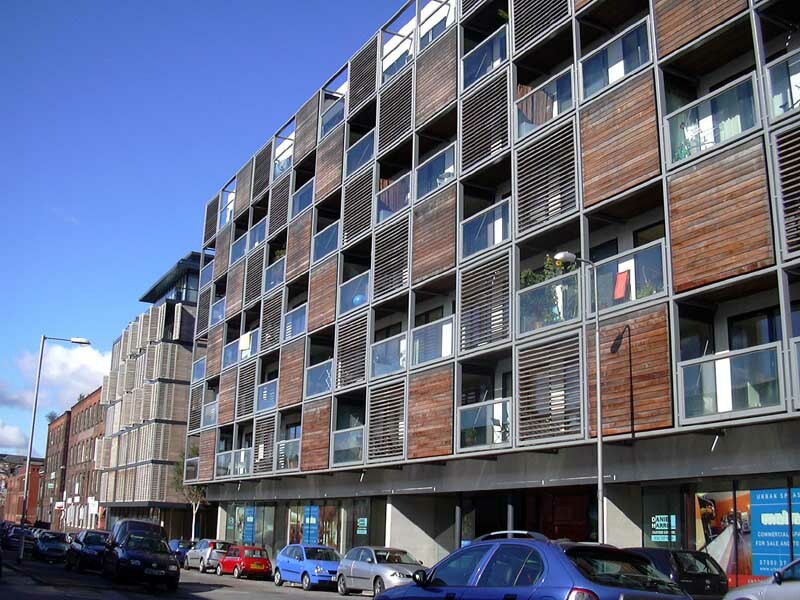 Principles such as building up to the pavement, continuing frontages, shared gardens, underground parking and decent heights (4, 5, 6 storey) make for a truly urban residential environment, as has been commonplace on the continent for a long time, where the idea of the city is much more naturally accepted. Even our provincial towns are following suit, with Manchester leading the way in mill and warehouse conversions. Such schemes remain popular with 30-somethings, singles and childless couples. They have yet to wholly win over the core unit of society, the middle-income family. What is clear is that many of our cities have densities that hover a little over that of L.A. - i.e. not dense at all. The most densely inhabited piece of Gt. Britain is Kensington and Chelsea which is approaching comparison with some of the denser world cities, such as Paris and Manhattan, although these in turn will have neighbourhoods of even greater density. The 11th arrondissement of Paris, for example, achieves a staggering 41,600/km2. Melbourne seems downright negligent by comparison but the Australians do enjoy the one luxury we can't afford - space! What is the point of all this? Well, that we do have legroom. Our cities are not overcrowded. Anyone who tells you otherwise needs to spend less time in Chipping Sodbury and more time in Chicago. But how can we roll up acres of old low-rise and start again at higher densities? It doesn't seem that simple, especially since mostly these properties are privately-owned and the owners are quite happy. What is worth keeping and what isn't will have us divided. The horror estates can disappear and not be missed but some streets, no matter how derelict, will accrue sentimental value amongst their residents and they will be kicking and screaming to keep them. Such is the case in Salford, where decaying terraces are the subject of a rescue-or-raze debate, even though the type is extremely common, and was never wonderful in its prime. Add to this an element of suspicion. Quite understandably really, since the last time someone came along promising a bright new future all they got were monstrous windswept tower blocks. With the lessons of the 60s learned, however, we are hopefully ready to come up with decent solutions. Let us not swing the pendulum back the other way and replace these mistakes with suburbanised versions of the same thing. We can avoid the mistakes of the past, build on the successes and not have to produce schemes that pretend to be what they are not. It needs to be organic. The conditions have to be right. i.e. for your roses to grow big and tall you need to water them regularly, leave them against a sunny south facing wall, in fertile compost, sheltered from breeze, give them a dose of horse manure every winter, and trim off the dead heads. ...and a similar idea in Copenhagen. The equivalent in building terms is going to be: service provision (schools, hospitals, roads, play space for the kids, integrated off-street parking etc. ); transport - it has to be feasible to get to work quickly; economic incentives (we can't cripple people with council tax and water rates), and some sort of tax exemption for improving/making best use of a site; great architecture (makes great places to live - let's throw open competitions); law (a last resort - but to make sure opportunities are not wasted, eg. in Salford (population density lower than Los Angeles! ), derelict terraces should be bulldozed, not restored; place a moratorium on 'suburban' style development in inner cities. Simply, we have to make our cities so darn appealing to live in that people will literally be climbing over themselves to live in them. And how to avoid that perennial bugbear in urban design, bland uniformity? In Amsterdam, the architect Adriaan Geuze demonstrated a promising principle with Scheepstimmermanstraat. He divided the street into 60 plots and then allowed (admittedly well-heeled) residents to design their own homes. The only constraints were the dimensions. If you can allow complete freedom within certain rigid boundaries the overall effect - harmony with diversity creates an engaging, pleasant urban space. How to extrapolate that principle over a large scale and with a lower budget? Well, you just have to set the parameters, and give various portions of a brief to different contractors to interpret, and insist on an architect being involved - the same one who submitted the brief for approval in the first place! A modicum of good taste in the planning departments would be no bad thing either. The final, and perhaps greatest hurdle is the British people themselves, and particularly the middle-income family who traditionally inhabit the semis and terraces of suburbia and dormitory towns and whose aspiration is nothing more (nothing less) than a two-floor house with a private garden. Currently they are badly let down. Our new housing stock is the pokiest in Europe and prices are overinflated by the shortage of available land, itself partly a product of greenbelt policy. In these conditions construction quality is poor and builders are only employing architects as a last resort. Anything sells! The same applies to new city centre apartments. Until this changes convincing them that an urban lifestyle can fulfill their aspirations will be hard. Ironically, it may be tearing up the green belt rules and ending the 'land shortage' which will do it, leading to lower house prices, greater competition among builders, and an increase in both size and quality, in both city and suburb. But balancing that with the pressure to sprawl outwards is going to be a challenge. The suburban aspiration is pretty much hard-wired. Approximately 1.7m new Londoners are expected to arrive in the coming years, many from abroad. It may be these immigrants who lead the way in our urban renaissance, with a greater cultural appreciation of the city life. They may even teach us that final goal - civic pride - for people to love their city as much as the Parisians do, and want to live there, rather than continue the inexorable chain of exodus, new development and exodus again. We will know we have achieved this when the Maidenheads stagnate and the Camberwells boom.